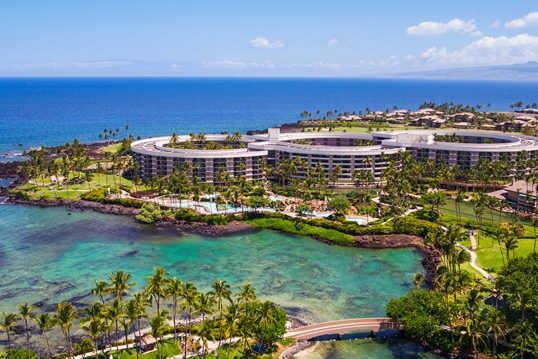 Billed as the Big Island’s premier oceanfront resort, the Hilton Waikoloa Village offers a near unlimited amount of things to do, across 62 gorgeous Hawaiian acres perfect for a scene-stealing destination wedding. Your wedding guests will find so much to do before and after your Hilton Waikoloa wedding ceremony, from scenic boat rides to a private lanai for kayaking. 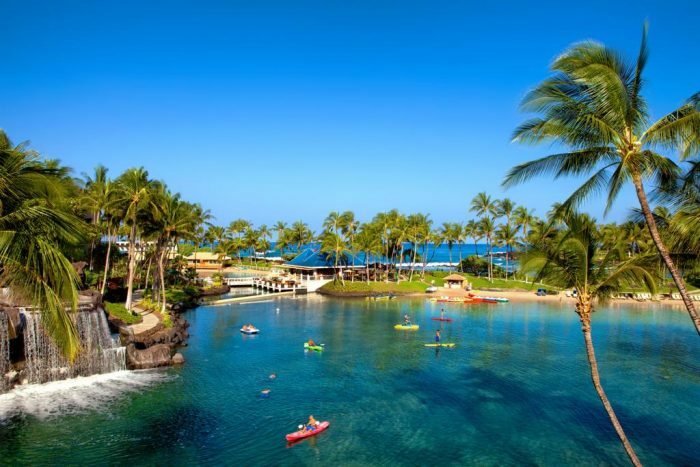 All across the Hilton Waikoloa Village resort, you’ll find romantic nooks and crannies to enjoy the lush surroundings, but it may take more than just one vacation to see everything the resort has to offer! A unique boat journey takes you across one end of the resort grounds to the other, and there are tons to do, with lagoon-inspired pools and even a dolphin encounter. There are a large amount of venues available for your wedding ceremony, from the dolphin encounter deck to an intimate religious chapel. The resort is truly family friendly and has even gained the nickname “Disneyland” of Big Island, perfectly suited for wholesome wedding parties with lots of children. 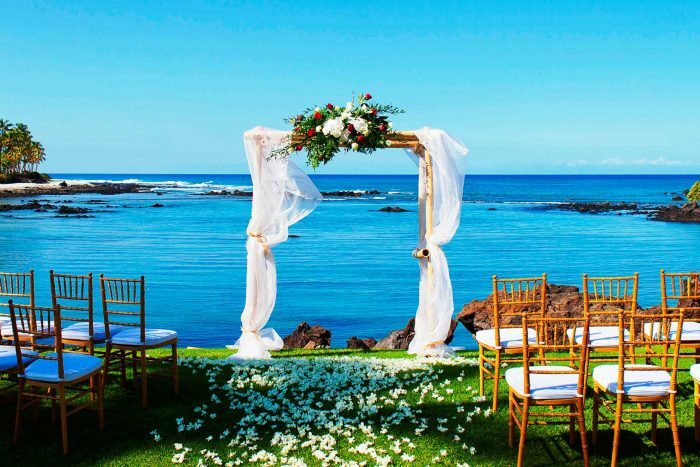 Hilton Waikoloa is able to accommodate alacarte weddings and welcomes customizations to their packages. Additional fees and time restrictions apply to the Dolphin Quest Lanai ceremony venue. It is important to note that our wedding packages in Hawaii do not include the cost of a reception, other venues, food, or drinks within the package pricing. Inquiries for these additional services must be made separately. Upgraded packages, additional guests, and add-ons are available for an additional cost. Palace Gardens – 200 guests max,Grand Staircase – 100 guests max, Oceanview Terrace – 100 guests max, Buddha Point – 50 guests max, Dolphin Quest Lanai – 40 guests max, Wedding Chapel – 40 guests. max. 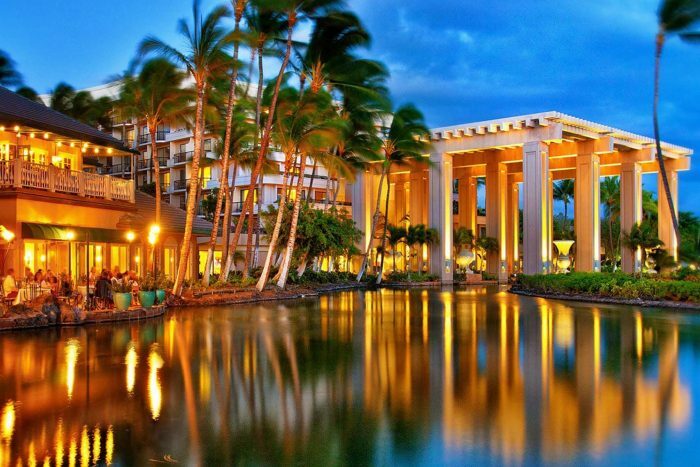 Hilton Waikoloa Beach hosts up to 4 weddings per day. $260 – $330 average price per night with 2 adult occupancy. Rooms include private balcony or terrace and evening room service by request. There are 1200 rooms with resort ocean views. Due to the sprawling nature of the resort, it is recommended for more active guests. Trams and boats are available to get around the property. The resort is located 25 miles from the KOA airport. 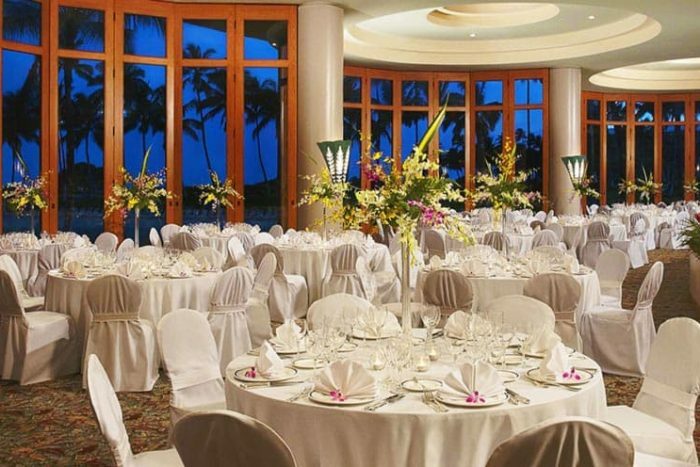 Palace Gardens – 200 guests max, Grand Staircase – 100 guests max, Oceanview Terrace – 100 guests max, Buddha Point – 50 guests max, Dolphin Quest Lanai – 40 guests max, Wedding Chapel – 40 guests. max.